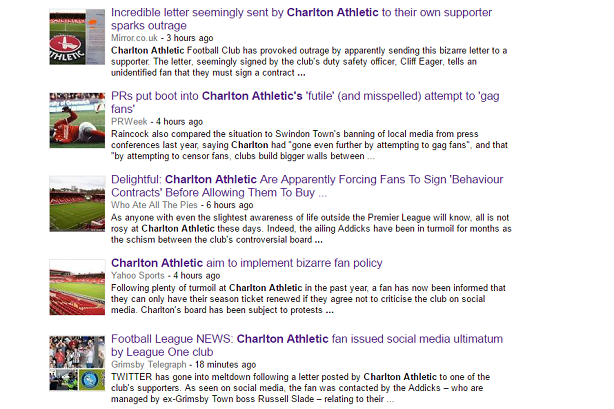 Charlton Athletic may have been the victim of social media misfortune over initial reports of apparent attempts to "gag" a fan - but the club is far from blameless for opening itself to criticism with the way it communicated with the punter. A story of two halves: Charlton suffered bad press, but was it merited? On Friday morning, a letter written by the club to a fan was shared widely across Twitter. The letter said the club would only allow the fan to renew their season ticket on signing an 'Agreed Behavioral Contract', which would include a promise not to make "inflammatory comments" about the club on social media. This drew immediate anger from social media users, including prominent football writers and popular blogs. The club had not responded to requests for comment when PRWeek published a story at 11am in which a number of PR professionals criticised the club. A 380-word statement, published on the club's website around 12.30pm, said that the letter was only sent to one fan, and related to "continued" social media abuse and "foul and abusive language captured on stadium cameras". The statement said that it had held a meeting with the fan on Thursday – at which the fan was accompanied by the chair of the Charlton Athletic Supporters’ Trust – and "it was emphasised that the meeting was not due to any involvement with supporter protests, but solely in response to his continuous, personal behaviour and abuse". It concluded by saying that the meeting "ended amicably", with the fan's "sincere" apology meaning he was not asked to sign a contract, and that he was allowed to renew his season ticket. However, The Guardian reports that the fan, who asked not to be named, was less impressed by the encounter. "I don’t care what they do now. I’ve had enough of the club and how they’ve tried to treat me," he said. Even though some stories published by various outlets earlier in the day have now been amended to take a tone more sympathetic to the club in light of the statement, it is clear that Charlton has suffered damage and lost goodwill over the storm. Adam Raincock, a director at Synergy Sponsorship who had this morning urged caution in reacting to the letter, said: "In this case it’s clear that the club acted in a logical and professional manner and made the correct decision. "This situation highlights the inherent danger of social media. The lack of transparency and its fast-moving nature means there is no time or will for fact checking," he went on to say, noting that this was particularly problematic given the conflicting interests involved. Andy Sutherden, global head of sports and partnership marketing at Hill+Knowlton Strategies, said: "The club was naïve in action but honourable in intent." He compared the situation with the way Arsenal is dealing with the same issue, and noted that reports of this were much more favourable. He said the club had been clumsy, and had "lost the moral high ground by allowing the aggrieved fan to present one side of the story via social media, which provided the oxygen of publicity". "The relationship between fan and club is a relationship that needs to be handled so carefully," Sutherden said.